"It was destiny. We are soul mates." Love may come in all shapes and sizes, but after a breakup with her boyfriend, the hole in Rylee Rae's heart was a very particular shape. And even a certain texture. 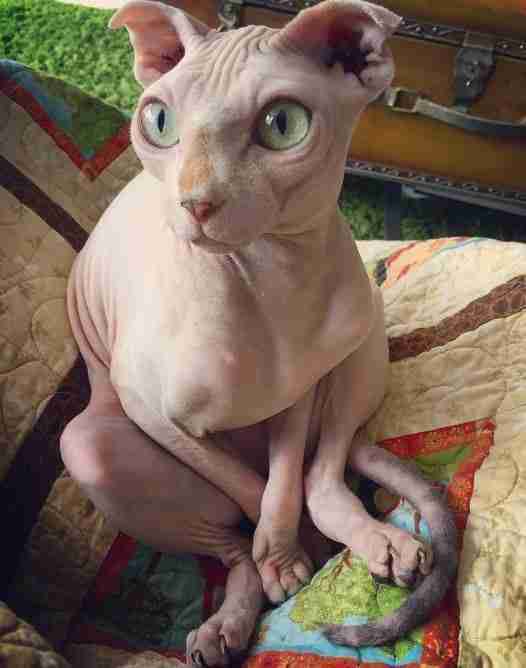 Rae had a hairless-kitty-shaped hole in her heart. After all, when her boyfriend left, he took both cats with him. 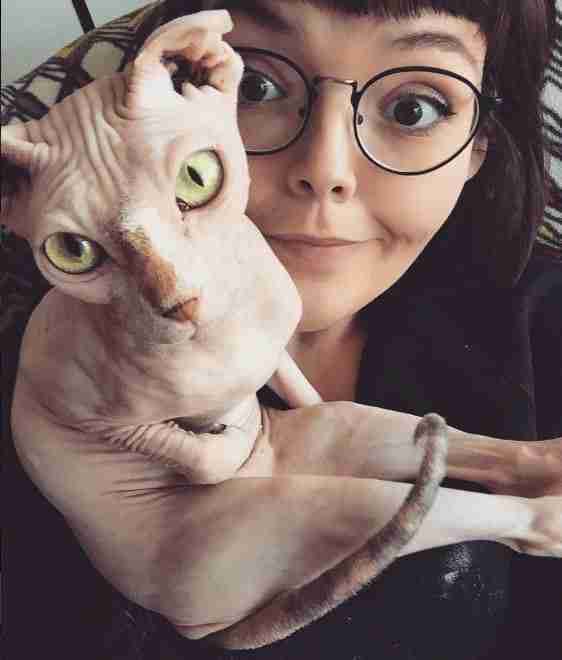 "I was looking for a hairless cat," she tells The Dodo. 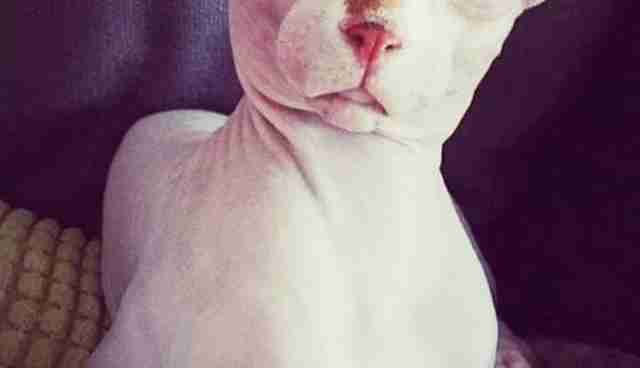 "I've loved hairless cats since I was a child and was scouring adoption sites for months." She never expected to find Delores. 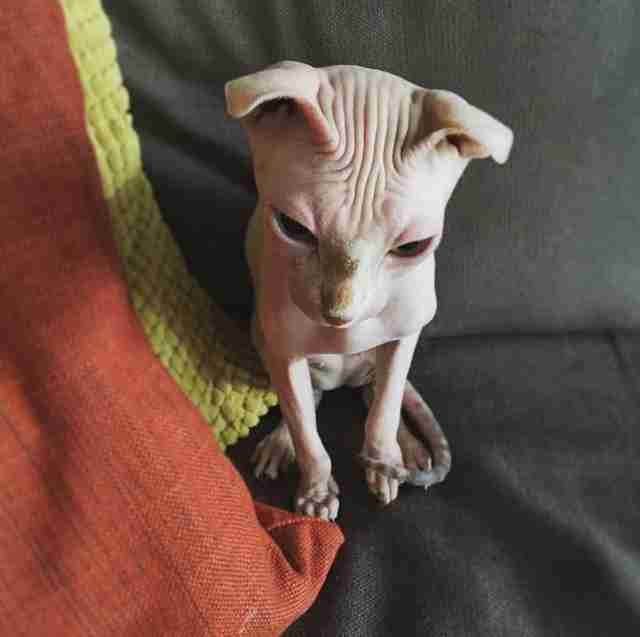 After poring over adoption sites - Rae insisted on rescuing a cat - she got an alert: HAIRLESS CAT FOUND. It turned out there was a certain saucer-eyed siren calling out to her from a couple of hours south of Toronto. 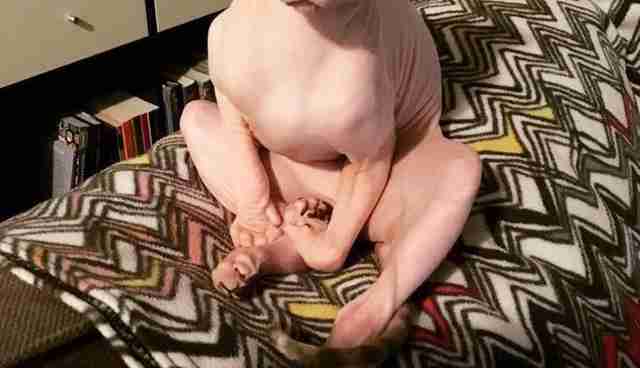 The cat, a cross between a sphynx and a Scottish fold, was having trouble in a house filled with other cats. She was being bullied and needed out. "The post was up for 20 minutes and I messaged them and was like, 'Please let me love her unconditionally for the rest of her days,' and they said, 'Absolutely,'" Rae recalls. Two weeks ago, she made the drive to Niagara Falls, collected her soul mate and drove home. And soon got lost in those otherworldly eyes. "It was destiny," Rae says. "We are soul mates." And Delores, despite being completely hairless - except for a charming patch of fuzz on her nose and tail - generates her own comforting warmth. "When she lays on you she is like a hot water bottle," Rae says. "And she sleeps under the blankets at night." "I'm a little worried about the winter months but I have my mother who is a fantastic knitter and is on the job to make us winter knits," Rae says. Besides, they've got each other. "She is a real life chicken cherub angel sweetheart," Rae says. "That's what she is." And let no ex-boyfriend come between them. You can follow the adventures of Delores and Ryleee Rae here.